Even though the ECB didn't deliver anything new in regards to its planned TLTROs or the rumours around tiered deposit rates for European banks, a no-deal Brexit seems off the table (at least for now). And while we still have to wait for a trade deal between the US and China, the fact that the DAX30 CFD didn't see significant selling pressure on the latest "TTT" (Trump-Tariff-Threat) after the WTO found that the EU subsidies for Airbus had adversely affected the US, and tariffs on 11 billion USD of EU product are on its way - is a positive sign. That said, the SP500 CFD adds to this optimism: over the last 21 years, the SP500 CFD has gained on average 21 points within the time span of the 15th to 19th of April in 76% of the cases or 16 years. With this in mind it seems likely, that the DAX30 CFD will stabilise around if not significantly push above 12,000 points before Easter with a potential sharp drop in volatility into the mid of the week. From a technical perspective, the picture stays positive as long as we trade above the SMA(200) and the target around 12,500 points stays active. Only a drop below the SMA(200) and 11,250 would clearly darken the technical picture. Source: Admiral Markets MT5 with MT5-SE Add-on DAX30 CFD daily chart (between November 23, 2017, to April 12, 2019). Accessed: April 12, 2019, at 10:00pm GMT - Please note: Past performance is not a reliable indicator of future results, or future performance. Our analysis of the US dollar hasn't significantly changed over the last week of trading. While 10-year US Treasury yields keep on stabilising, the ECB didn't deliver anything new in regards to the monetary policy with Draghi pointing to the next meeting in June and market participants still wait on details around the US/Chinese trade deal. With that in mind, and the prolonged Easter weekend ahead, subdued volatility is to be expected from Wednesday onwards. With no expectations of further details regarding the trade deal between the US and China coming, we don't see significant pushes on the up- or downside for the USD in the coming days. The technically relevant levels are around the range 97.00 points on the upside where an upwards break activates 98.00 points as a potential target, while on the downside the region around 95.00 is of high importance. During the last week of trading, all eyes were on the ECB. The ECB elected to hold, as expected, all rates at their current levels, MRO at 0%, Depo at -0.4%, and communicated that it sees rates staying at present levels at least through the end of 2019, while planning to reinvest the QE debt for an extended period of time after its first rate hike. Even though all of this was expected, the ECB did not make any references to TLTROs or tiered deposit rates which could have realistically resulted in a push to and below 1.1200 for the EUR/USD. Instead, the currency pair saw only a short push on the downside from which it quickly recovered. Nevertheless, the used lingo from Mario Draghi at the press conference where he reinforced that all instruments are available underlined that the overall outlook for the Euro stays bearish. This is probably especially true after US president Trump brought back potential tariffs on EU products worth 11 billion USD, adding to rising recession fears in the EU. Source: Admiral Markets MT5 with MT5-SE Add-on EUR/USD Daily chart (between November 29, 2017, to April 12, 2019). Accessed: April 12, 2019, at 10:00pm GMT - Please note: Past performance is not a reliable indicator of future results, or future performance. Over the last week of trading, the USD/JPY was capable of holding above 111.00 and go for another stint towards 112.00. 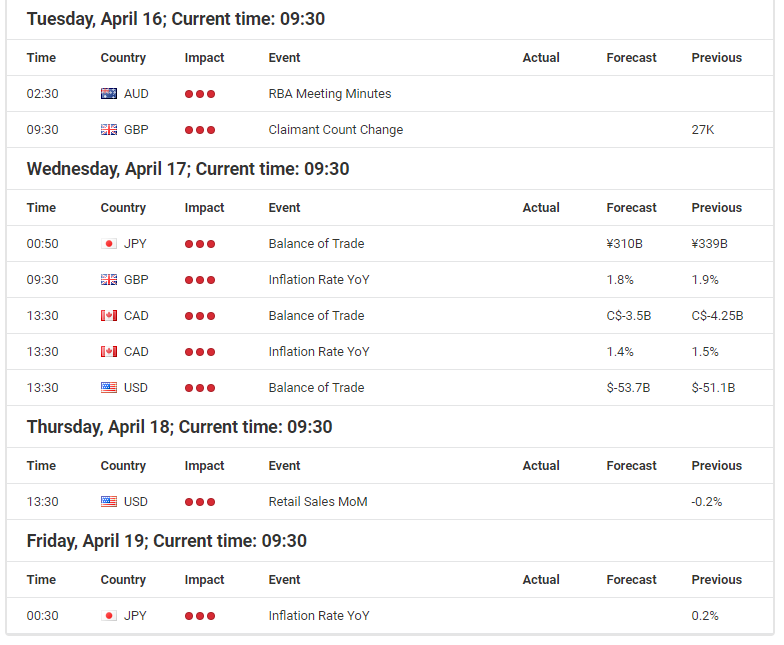 This is usually considered a positive sign, however, since the upcoming Easter weekend and the to be expected subdued volatility usually speaks for a potential risk-on market environment in which the JPY should normally underperform. That said and in combination with the ongoing stabilisation in 10-year US Treasury yields, the bullish seasonal pattern in the SP500 CFD which we discussed in the DAX30 CFD section above and the long awaited US/Chinese trade deal, new yearly highs and a push above 112.00 seems to have a quite high likelihood. If a break above 112.00 happens, further gains up to 114.50/115.00 become an option. Source: Admiral Markets MT5 with MT5-SE Add-on USD/JPY 4-hour chart (between January 12, 2019, to April 12, 2019). Accessed: April 12, 2019, at 10:00pm GMT - Please note: Past performance is not a reliable indicator of future results, or future performance. In 2014, the value of the USD/JPY increased by 13.7%, in 2015, it increased by 0.5%, in 2016, it fell by 2.8%, in 2017, it fell by 3.6%, in 2018, it fell by 2.7%, meaning that after five years, it was up by 4.1%. The technical picture for Gold remains not only very interesting with the potential head-shoulder formation on a daily chart, but also somehow bearish. Even though Gold bulls made an attempt to push the yellow metal back above 1,300 USD, the precious metal closed the week below this current psychologically relevant level, bringing the neckline and the important support region around 1,275/277 USD back into the focus of market participants. While the upcoming, prolonged Easter weekend leaves chances of high volatility and a break in the day to come low, a thinning out market environment could result in a surprising and sharp break of 1,275 USD. Such a downward break activates the region around 1,235/240 USD as an initial target on the downside. Source: Admiral Markets MT5 with MT5-SE Add-on Gold Daily chart (between January 14, 2018, to April 12, 2019). Accessed: April 12, 2019, at 10:00pm GMT - Please note: Past performance is not a reliable indicator of future results, or future performance.